Veganism is described as one of the fastest growing lifestyle movements in the world. Some estimates claim that in the United states alone, there was a 500% increase between 2014 and 2017 in the number of Americans (around 19 million) identifying as vegan. For the wine industry, that is a sizable demographic that retailers and wineries have value in marketing to. So what makes a wine “vegan-friendly”? For the most part, veganism is a code of conduct that avoids using any animal products or by products as well as anything that has been tested on animals. There are various reasons why people adopt veganism but often ethical concerns about the treatment of animals and impact on the environment are cited. While wine is often assumed to be vegan, the use of animal-based fining agents such as casein (milk protein), albumin (egg whites), isinglass (fish bladders) and gelatin (animal collagen) in winemaking is problematic for many vegans. As Alison Crowe notes in The Wine Maker’s Answer Book, fining agents are used to help clarify and stabilize wine by binding to molecules such as proteins and excess tannins. These are items that can cause unsightly haze in the bottle, aggressive bitterness on the palate, off odors and flavors. The agent binds to the target molecule to form larger structures that eventually precipitates and settles to the bottom of tank or barrel as sediment. Bruce W. Zoecklein et. al in Wine Analysis and Production classified the various fining agents into 8 categories based on their nature. Isinglass and bentonite fining trials. 7.) Tannins often derived from insect galls on oak leaves though oak chip fining can also fall into this category. 8.) Others which includes both enzymatic fining (more fining aids rather than fining agents) and chelators that assist in the removal of metals such as “blue fining” with potassium ferrocyanide (illegal to use in the United States). The different fining agents work on principles of electrical charge (like positively charged gelatin reacting with negatively charged tannins), bond formation (like the carbonyl group of PVPP bonding with the hydroxyl group of tannins) and by absorption/adsorption (like activated carbon absorbing off odors or bentonite adsorbing proteins). There are positive and negative attributes to each fining agent with no one fining agent being perfect for every situation. Used primarily to remove excess tannins. Works by forming hydrogen bonds with the hydroxyl groups of tannins. Compared to other fining agents like gelatin, albumin tends to remove less positive flavor and aroma traits. Egg whites have a long history of use in winemaking in places like Bordeaux and Burgundy. The usual addition is 1 to 3 egg whites per 225L (59 gallon) barrel. Used primarily to remove browning or pink color in white wine. Can also be used to remove some off odors. Works by adsorption and attracting negatively charged particles. Like with egg whites, it has a long history of use in wine production, particularly with the great white wines of Burgundy. It also has the benefit of reducing the concentration of iron and copper in wine. In red wines, it can negatively impact the wine by removing the polyphenol resveratrol that has been associated with various health benefits. Used primarily to remove excess tannins. It has a positive charge that reacts to the negative charge of harsh tannins. It can be prone to over-fining that can strip a wine of positive flavors and aromas. 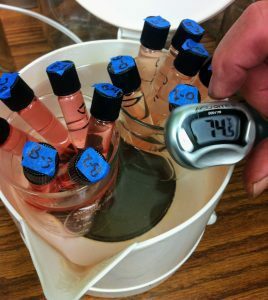 A heat stability trial for rose wines that have been fined with isinglass. Used primarily to help clarifying wines, remove excess tannins and to “unmask” or bring out varietal character. Used primarily to remove haze causing proteins from white wines. A positively charged agent, it often needs to be paired with a negatively charged fining agent like Kieselsol to be most effective. Historically used but illegal in the United states, France and several other countries. The website Barnivore is a database of wines and other liquors that have been vetted by users to be either “vegan-friendly” or not. In answering queries about their use of animal based fining agents, many wineries share their alternative methods. Letting the wine settle and clarify on its own before racking into another container is one method to avoid using fining agents. One common method is the use of time and gravity to let the wine settle and clear out on its own. This is the technique used by Baldacci in the Stags Leap District and many other wineries. Depending on several factors like the health of the grapes, method of pressing, pH and temperature, this method could take several months and even then the wine might not be completely stable. Some wineries facilitate this method with the use of mechanical centrifuges and ultra-filtration but these carry the risk of being overly aggressive and potentially stripping the wine of positive flavor and aroma attributes. Along those lines, many wineries adopt a hands-off method of not fining or filtering their wines at all. This is the method used by many high-end wine producers like Black Cordon and Kapcsandy in Napa Valley. This does carry the risk of haze and sediment developing in the bottle. However, the risk is often presented to consumers as a trade-off for having potentially more complex and flavorful wines. The lees sediment and volume loss from bentonite can be significant (between 5-10%). Using counter-fining agents like isinglass can help with lees compaction but would obviously make the wine not vegan-friendly. The most used “vegan-friendly” fining agent is bentonite. This is a type of clay that can dramatically swell in size to adsorb protein molecules. This is the method used by wineries like Chinook in Washington State, Ideology in Napa Valley, Spier in South Africa and many others. One big drawback is that it causes significant loss of wine volume due to the heavy sediment it creates. As much as 5-10% of volume could be lost. Roger B. Boulton et al notes in Principles and Practices of Winemaking that these voluminous bentonite lees also create a large amount of solid waste that can have an environmental impact (such as sealing percolation ponds) if not properly disposed. In red wine, there is also a risk of color loss. Some wineries like Amici use the technique of “yeast fining” for wines like their 2013 Russian River Pinot noir. This involves adding fresh yeast to a wine. The cell walls of the yeast contain about 30% positively charged proteins. These can then adsorb many polyphenols and compounds which cause off odors. It brings the risk of the yeast breaking down as lees, releasing sulfur compounds and enhancing reductive notes. Also, if not removed by filtration, the yeast in the bottle can start re-fermenting any residual sugars. This would cause spritziness in what is, otherwise, supposed to be a non-sparkling wine. PVPP is a synthetic polymer that can remove bitter tannins and brown discoloration from white wines. Like casein, it can remove the polyphenol resveratrol from red wines. There is also a risk of overfining. This is because the PVPP also binds to desirable tannins and anthocyanins needed for structure and color. Sparkalloid is a blend of polysaccharides and diatomaceous earth (fossilized algae) that can be used to clarify white wines. It does take significant time to eventually settle. This also creates a fair amount of waste with the DE that requires proper disposal. Activated Carbon can be used to remove off-odors such as mercaptans (rotten eggs, burnt match). It does have the risk of overly oxidizing wine as well as stripping color and resveratrol from red wines. Ronald S. Jackson notes in Wine Science that fears about the prions potentially in gelatin and “Mad Cow” disease, encouraged studies into the use of plant proteins like wheat gluten as a substitute for gelatin. (Note: most gelatin used in US winemaking is derived from pigs rather than cows) Likewise, a New Jersey company has been experimenting with using pea proteins in conjunction with bentonite and silica as an alternative to gelatin. Interest in food allergies have also spurned innovations with Scott Labs developing a technique to isolated chitosan from the fungus Aspergillus niger (instead of shellfish and crustaceans) that can be used as a fining agent. The California based ATP Group has developed a way to extract tannin powder for fining from white wine grapes instead of insect galls to help soften tannins. In 2016, a Swiss company announced that they were experimenting with the use of UV light to soften tannins in lieu of using animal-based protein fining agents. Are wines produced from fruit sourced from biodynamic vineyards truly “vegan-friendly”? Several of the “preparations” used in biodynamic viticulture require the use of animal products such as cow horns (BD 500 and 501), stomachs, intestines and bladders. In an anecdotal account of a visit with the vineyard manager of the biodynamic Pinot noir producer Sea Smoke, Kirsten Georgi (The Armchair Sommelier), describes how the “Biodynamic approach” to removing gophers without the use of poisons or chemicals involves trapping several gophers, killing them, burning their ashes and spreading those ashes over the vineyard during winter solstice as a means to “scare off” the rest of the gophers. This method of “peppering” vineyards with the ashes of pests is not unique to Sea Smoke with recipes on biodynamic websites recommending its use for everything from weeds, snails and insects to mice, rats, rabbits and opossum. Manure composting at a biodynamic vineyard in Tasmania. Despite these practices, organizations like PETA recommend biodynamic wineries as “vegan friendly”. The UK website Vegan Wines Online notes that while “…natural animal products can however be used in the growing process“ all the biodynamic wines they sell are somehow suitable for vegans. Even organic viticulture could be problematic with the use of animal-derived bone and blood meal being used in lieu of chemical fertilizers. There is even debate if manure, as an animal by-product, is acceptable. Like honey and milk, manure doesn’t require killing the animal but still often requires farming to acquire. What about the presence of insects in healthy and vibrant organic vineyards? Does that makes a wine less “Vegan-friendly”? Eschewing the use of chemicals often means more insects as MOG (material other than grapes). Absent expensive sorting these bugs can get caught up in the harvest. On the Barnivore website, Calcareous Vineyard in Paso Robles expressed this reservation though their wines were still classified as “vegan friendly”. Are the most “vegan-friendly” vineyards the ones being farmed with heavy saturation of pesticides and chemical fertilizers? It seems like it when you compare it to organic and biodynamic vineyards with high insect MOG and animal-derived fertilizers. Mass produced wines like the PETA recommended Sutter Home and Moët & Chandon often employ these conventional, chemical dependent styles of viticulture. 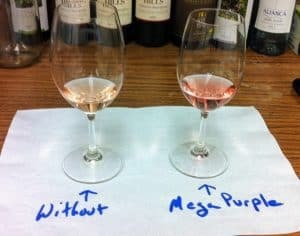 While avoiding using animal-based fining agents to remove excess tannins and haze forming proteins, big mega-corps can use other tricks to manipulate the wine with things like lab designed enzymes, oak adjuncts and Mega Purple which will “smooth out” bitter tannins and cover up off-flavors. Just a single drop of Mega Purple had this white Riesling looking and smelling like a Grenache rose. Crazy stuff. Sure, Charles Shaw reds (Two Buck Chuck), Sutter Home Cabernet Sauvignon, Meiomi Pinot noir and Yellow Tail reds are made without animal fining agents but should vegans (and really all wine drinkers) be concerned with what other products are being used to make these wines? And while it can be exciting to see advances in the use of pea proteins and fining agents derived from fungi like Aspergillus niger, its worth asking if these are only adding to the laundry list of the 60+ (and counting) additives that can be used in winemaking–taking it even further away from being just “fermented grapes”? While I’m not vegan myself, I wholeheartedly support anyone that chooses to live their life by convictions. I respect their ethical concerns for the treatment of animals. I also share their concerns about the environment animal products have. It’s not my wish to stress-out vegans who just want to relax and enjoy a nice bottle of wine. I do believe it is fair to think about the big picture involved in many seemingly “vegan-friendly” wineries. Often the viticulture and winemaking practices they use may not align with the ideals of many vegans. However, it is clear from sites like Barnivore that there are tons of environmentally conscious wineries (many of which are even owned by vegans) that are producing vegan-friendly wines. They may not be the easiest to find at grocery stores or restaurant wine lists that can be dominated by the portfolios of the large mega-corps but these often small family-owned wineries are well worth seeking out and supporting. And that’s something that I think both vegans and non-vegans can drink to. Tagged activated carbon, Albumin, Alison Crowe, Amici, Aspergillus niger, ATP Group, Baldacci, Barnivore, bentonite, biodynamic, Black Cordon, Blood Albumen, blue fining, Bordeaux wine, Bruce W. Zoecklein, Burgundy wine, Cabernet Sauvignon, Calcareous Vineyard, Casein, Charles Shaw, Chinook Wines, Chitosan, diatomaceous earth, Egg whites, fining agents, food allergies, gelatin, gluten, gum arabic, heat stability, Ideology Cellars, Isinglass, kaolin, Kapcsandy, Kieselsol, Kirsten Georgi, Mega Purple, Meiomi, mercaptans, Moët & Chandon, MOG, Napa Valley, oak adjuncts, oak chip fining, Organic viticulture, Paso Robles, PETA, Pinot noir, polyvinylpolypyrrolidone, potassium ferrocyanide, Principles and Practices of Winemaking, protein haze, protein stability, PVPP, racking, resveratrol, Roger B. Boulton, Ronald S. Jackson, Russian River, Scott Labs, Sea Smoke, Silica gel, South African wine, Sparkolloid, Spier, Stags Leap District, Sutter Home, tannins, The Armchair Sommelier, The Wine Maker’s Answer Book, unfiltered, unfined, UV light, Vegan wines, Vegan Wines Online, veganism, Washington wine, Wine Analysis and Production, wine production, Wine Science, yeast fining, Yellow Tail.